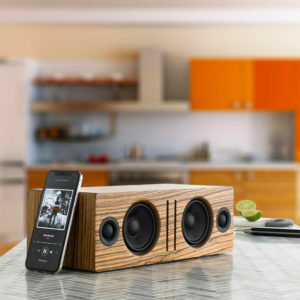 The A5+ Wireless Speakers are Bluetooth speakers with sound that fills any room and connects to any device. No network setup, passwords to enter, or buttons to push. The ultimate wireless music system that seamlessly works with all your apps, music, and devices. No matter how you listen, A5+ Wireless has you covered. 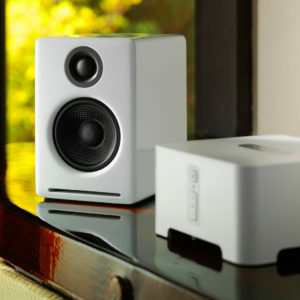 The A5+ Wireless Speakers are bookshelf speakers packing a big sound that fills any room. Clear, full and powerful audio that fills any room. The A5+ Wireless Speakers are constructed with custom Audioengine components: aramid fiber woofers, silk tweeters, high-fidelity Premium Bluetooth aptX-HD, and built-in power amps wrapped in precision tuned, hand-crafted cabinets. Perfect for any size space. Do A5+ Wireless speakers have an auto-sleep, idle, or auto-power-off function? And can I leave them on all the time? The A5+ Wireless have an idle mode which is engaged automatic when nothing is playing. The lights will remain on and solid and nothing needs to be done to resume audio playback. The sleep mode on the A5+ is manual and can be toggled on/off by pressing the volume knob in or by clicking the moon button on the A5+'s remote, so it won't go into sleep mode automatically. Sleep mode will just reduce the power more than idle mode. It is perfectly fine to leave your A5+s powered on when not in use! Just how easy is it to set up the A5+ Wireless? What’s the difference between the A5+ Wireless and the A5+ Classic? The A5+ Wireless uses the same amplifier design and woofers that the A5+ Classic does, so both the A5+ Wireless and the A5+ Classic should sound virtually the same. The biggest difference between the two is the added Bluetooth receiver built into the A5+ Wireless; we’ve added a 24-bit DAC built inside that connects any bluetooth capable device (whether be your phone, tablet, or computer) to the speakers so you can stream high-quality music directly without having to use audio cables. The A5+ Wireless also features a minor cosmetic refresh; the most obvious of which includes centering the tweeters, as opposed to the offset tweeters featured on the A5+ Classic. What if my source doesn't support aptX? Can I still use A5+ Wireless and if so, how will it sound? You can absolutely still use the A5+ Wireless and it will sound great. AptX is a high-quality Bluetooth audio codec that works really well. In addition to mandatory support for SBC, Bluetooth also includes optional support for many other codecs, like MPEG-1, MPEG-2, MPEG-4, and AAC, all of which have their own advantages, and some of which sound very close to AptX. If A5+ Wireless is paired and connected to my phone, do I need to do anything else to play music? Once your A5+ Wireless is paired and connected then any app (iTunes, Amarra, etc.) - or online players such as Youtube - it will automatically play your music through Bluetooth. Is the A5+ Wireless designed only for use with Bluetooth devices? Should I use the volume control on the front of the A5+ Wireless or can I adjust from system volume on my computer? If the left speaker is in an easy to reach location, you can certainly use the physical knob. If not though, we generally recommend setting the A5+ Wireless at around 50% and adjusting from your source device, or the remote provided with the A5+ Wireless. Will my current universal remote work with my A5+ Wireless? The A5+ Wireless is not officially supported by any universal remotes. However, you can use a learning remote to copy the signals being sent by the A5+ Wireless's remote. Check with the manufacturer of your remote to find out if it supports learning IR codes. Yes! We've been notified that several Android IR Remote Apps support Audioengine remote commands. So if you have a phone with an IR blaster like the HTC One or the Samsung Galaxy S4 you can use the App to raise or lower the volume of your speakers with your phone! Simply download one of the many IR Remote Apps on Google Play, and test them out. Can you stream music wirelessly to the A5+ Wireless with the Audioengine wireless adapters like you can with the A5+ Classic? Yep, an AC wall outlet near the A5+ Wireless is all you need to power the W3 or D2 wireless Receiver. Yep, an AC wall outlet near the A5+ Wireless is all you need to power the AW3 wireless Receiver. Simple. I'd like to connect an Apple Airport Express to my A5+ Wireless speakers to stream music from my Mac. I also wish to connect the speakers to my Samsung LCD TV. Is it possible to have simultaneous connections to the A5+ Wireless? If I have a subwoofer of my own, how would I use it with the A5+ Wireless? All you would need to do is connect the variable output of the A5+ Wireless into the input of your sub using RCA cables. Do I need to install any special software apps or drivers for the A5+ Wireless? No extra software or drivers are needed. The A5+ Wireless is compatible with any device that supports Bluetooth, and the A2DP profile for streaming stereo audio. This includes most smartphones, tablets, and computers. If I connect my turntable to the A5+ Wireless will it be necessary to purchase a phono preamp or can I simply connect the turntable directly to the A5+ Wireless input? When I connect a turntable to my speakers, why is the volume so quiet? Some turntables do not have a built-in preamps and as a result you will need to add an external phono preamp between your turntable and the speakers. Many turntables, however, (such as the Music Hall USB-1 or Audio Technica AT-LP120) have a built-in preamp and include a switch on the back for "line" or “phono”. For Audioengine powered speakers select "line". What does the indicator light on the A5+ Wireless rear panel mean? If it's on and solid, this means the A5+ Wireless is powered on, and currently connected to a Bluetooth-enabled device. If your source is currently sending the A5+ Wireless an aptX signal, the LED indicator will illuminate orange instead of white. If it's on and blinking, this means the A5+ Wireless is powered on but not currently connected to a device. If it's off (and A5+ Wireless is powered on), this means Bluetooth is in standby and not connected to a device. The A5+ Wireless, however, is still visible to your device, so simply connect using your device and it will automatically wake up. Can I use my computer speakers and the A5+ Wireless at the same time? Is the A5+ Wireless compatible with TIDAL music streaming service? The short answer is yes! You can use TIDAL on any compatible source device (PC, Mac, iPhone Android, etc.). The A5+ Wireless is compatible with most all of these devices as well since they almost universally also include Bluetooth. OK, so If I can use the A5+ Wireless with TIDAL, how come you're not listed on TIDALs website? Will my music have a delay through the A5+ Wireless if I’m watching a movie or music video? Bluetooth has a delay of about 30ms (milliseconds) so you can watch videos and stream audio without any noticeable lag. When I connect a turntable to my A5+ Wireless, why is the volume extremely low? Some turntables do not have a built-in preamps and as a result you will need to add an external phono preamp between your turntable and the A5+ Wireless. Many turntables, however, (such as the Music Hall USB-1 or Audio Technica AT-LP120) have a built-in preamp and include a switch on the back for "line" or “phono”. For Audioengine powered speakers select "line".